Rugby Town Under 21s reached both the U21 league cup final and now playoff for the Under 21 Championships. The team, in partnership with The Strachan Football Foundation, play Mickelover Sports on Saturday, May 9 at Heather St Johns in Leicestershire. The group beat Sutton Coalfield Town 5-4 after extra time. Kick-off is at 12noon. Then next Thursday, May 14, they take on Heath Hayes at Coleshill Town FC for the right to be crowned the U21s champions. The game at Coleshill kicks off at 7.30pm. 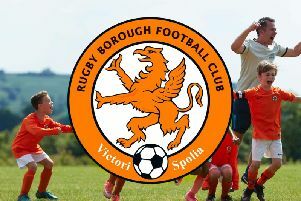 The club are looking for some new coaches to run teams for the 2015/16 season. Full training is given. Contact (01788) 568500 for more details. The club are looking for players in current year 9 to boost the current squad. Anyone interested please contact Mark Cross on 07504 536851. The club are also on the verge of announcing a big sponsorship deal. More details next week.